The Doll Shop is a horror visual novel where you take control of the unnamed doll shop owner as an old acquaintance arrives at the isolated village he lives in. What interested me the most about The Doll Shop was its art style. According to the studio’s website, the entire game was hand-drawn by “23 students from the French graphic art school ECV in January 2018.” It’s rare to see games created in this style today and I was excited to check out the game solely for its art. I am glad to say that I was not disappointed. 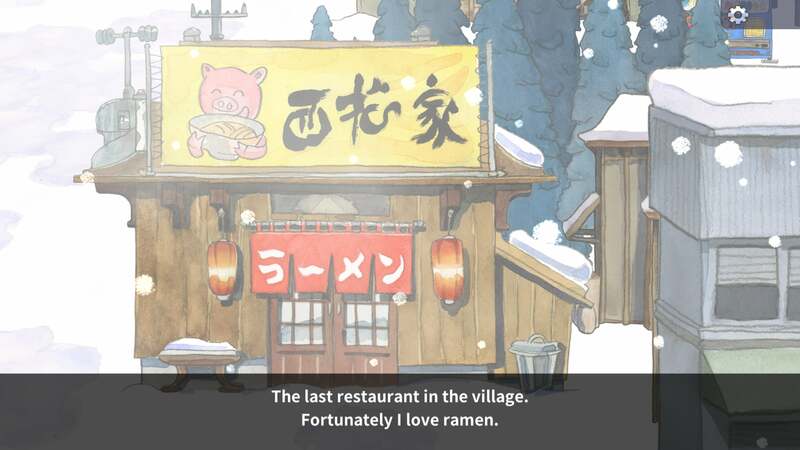 The game is filled with a lot of small details and every location feels like it’s actually been lived in. I could recommend the game simply based on the art design alone. The other aspect of the game’s presentation that surprised me was its music, as it truly makes the game’s themes shine, whether isolation, depression or mystery. Isolation is a strong theme throughout the game. 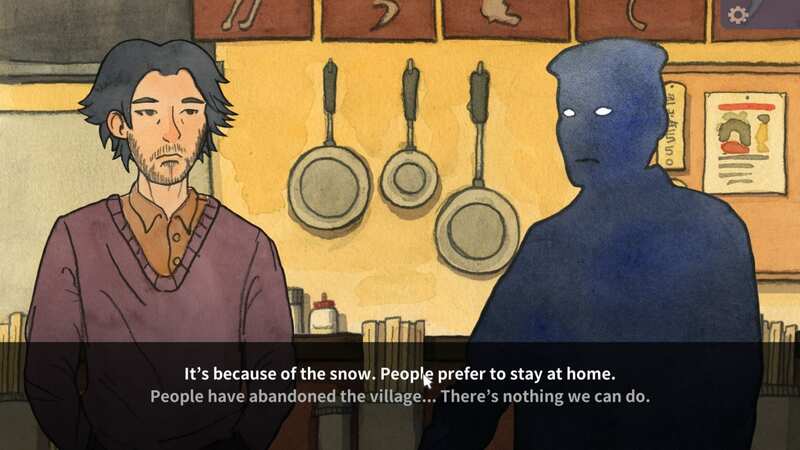 While not complex, the game’s point-and-click gameplay features some small interesting elements. Most of the gameplay design choices add to the game’s themes and the characterization of its protagonist. You will mostly walk around in the village from house to house by talking to the inhabitants and making dialogue choices that may affect your ending. All actions are performed with the mouse, including movement, which helps make walking around in the village slow and melancholic as the snow falls around you. It drives home how isolated and alone the protagonist feels inside. The other half of the game is spent at your desk, performing a mundane job such as fixing a doll. These tasks are as complex as the game gets with its point-and-click mechanics. In one of these segments, you slowly and methodically sandpaper a doll to clean up areas where it was glued back together. I actually liked how repetitive and shallow these moments were as it helped better present our protagonist’s job. All of these elements lead to the game’s most enigmatic aspect, one that I am still thinking about – the protagonist’s psychosis. While I won’t spoil the game’s ending, it left me thinking about the protagonist’s mental state and what could have led him to perform the actions he did. The Doll House focuses heavily on how isolated and empty the small village is and how there is very little life left in it. Throughout the game, we see how this affects the protagonist and that this has gotten to the point that he is experiencing serious dissociative episodes. The main character sees people around him as grey shapes, experiences blackouts and passes his time with a room full of dead butterflies and a doll he believes to be alive. I was genuinely surprised by some of the more subtle characterizations of the protagonist. While I wanted there to be a little more closure and the true ending felt somewhat comedic, I found him to be absolutely fascinating. It’s sometimes difficult to figure out what our protagonist’s true feelings are when it comes to the dialogue choices. The only aspect I felt the game could have done much better was its horror. The game is supposed to be a horror visual novel, but beyond some disturbing imagery and characterization, there is no horror here. I think the other elements make the game worth checking out, but if you are searching for an experience that will frighten you, this is not it. The Doll House is a short, beautiful tale that you should definitely check out when you have the time. Fortunately for you, the game can be completed in two to three hours. It even points out how to unlock its endings and has a chapter select so you don’t have to play from the beginning. You can play The Doll House for free on itch.io. Senior at the American University of Paris, Majoring in creative writing and Minoring in computer sciences. Currently working on a novel and planning to be a narrative designer in the future.